The master, Hseuh-Feng, asked a newly arrived monk where he had come from. The monk answered: "From the Monastery of Spiritual Light." The master said, "In the daytime we have sunlight; in the evening, lamplight. What is spiritual light?" The monk had no answer. The master said, "Sunlight. Lamplight." The sun shines not on us, but in us. The rivers flow not past, but through us, thrilling, tingling, vibrating every fiber and cell of the substance of our bodies, making them glide and sing. As I may have told you, two weeks ago I submitted to a biopsy of my prostate gland. Such a procedure is not altogether uncommon for men my age. It involves removal by a kind of slicing needle of six tissue samples from the gland, and was performed in my urologist's office without sedation and I drove home. Earlier today my physician shared the results with me in his office. Apparently one of the samples cannot be confirmed as negative of any trace of a cancer. The other five are OK. This means that next week we need to do another biopsy, this time involving only two samples from that specific area of the gland. I seem to be a bit anxious during this medical work. I'm not socializing as much, nor answering my usual number of emails or phoning up friends and relatives. I suppose each person approaches this kind of thing in a very individual way, and getting quiet looks to be mine. I hope you understand and will accept my assurance I'll let you know the outcome. The lovely painting is entitled Quiet (c. 1881). 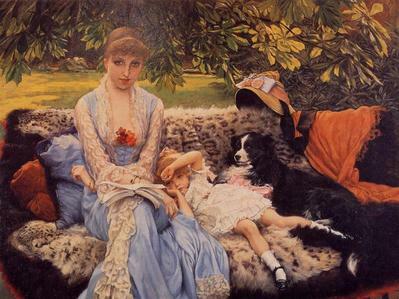 It is by the French painter, James Tissot. I rather felt that your silence had something to do with your ordeal. Sorry to hear that you are worried and can only give you my best wishes in the matter. Courage, friend, and soon the sunlight, lamplight, will light the way for you. courage and friendship to you my friend for a positive outcome. In your silence know you are not alone. sending loving (healing) thoughts your way. we miss you. It is a heavy weight on the mind when a part of the body is ill. Chin up. Technology is wonderful now for your problem. We are with you in spirit. 19 Feb 2004 @ 16:13 by craiglang : Sending healing thoughts your way.,.. and relax, over and over when you feel the tension. I can completely understand your absence during this time since I seem to approach difficulty in my life with the same reclusive habit. Most importantly, remember that a lot of good people (myself included) are sending you warm blessings and in spirit are all around you when you need someone. When I wrote to you Wednesday about my own medical situation of uncertainty just now, I did not do so to initiate replies of any kind. Rest assured if you didn't send one. I just was announcing a change in my rhythm and mood, and letting you know a new thing is happening. I also thought expressing something to people who know me might do some good. The replies that I did get were mostly of support and prayer, and I thank you for them. As I wrote back to our interim priest at Good Shepherd, I just had heard an interview on Fresh Air with Father Greg Boyle, a Jesuit who works with gangs in East LA http://freshair.npr.org/day_fa.jhtml?display=day&todayDate=02/17/2004 and who has had a bout with leukemia. Father Greg described how, while the battle with his cancer raged, people in his community formed a prayer group and assembled on his behalf. He said he always had thought that such petitionary activities were a bit below the highest notch of communing with God. You know...nice, but not the real stuff of sanctified intimacy. But he changed his tune when he felt the impact of such caring upon himself...and now he credits those prayers by others as a major factor in his healing. But also unearthed in your replies was a series of very private messages about similar experiences, either personal or with loved ones. I heard from people I've known for a long time---but not this side of them. These letters are taking me into a new level of understanding that perhaps I can't express very well...but I want to acknowledge and try. One doesn't want to take life and good health for granted, but if you're anything like me it's pretty hard not to. I'm nearly 64 and never have been in a hospital for any kind of big medical procedure for myself. I have my tonsils, my appendix, all the parts I came with in fact. I never had a serious illness, except scarlet fever as a child (which nevertheless is a strong memory). I've risked and abused myself with the best and the worst of them. Underneath it all, of course, I knew my payback time would come, but like everybody I hoped it would be a lightning bolt or something, and that I'd just drop dead. Prolonged pain, anxiety and suffering is a different matter, and not something anybody wants to hear about in the faculty lunchroom. So maybe that's why people tend to be quiet about such experiences in themselves and loved ones. One is tentative to share these delicate, fragile, dangerous feelings. In the hush of these last few days I have been privileged to enter this new circle of loving communication with people, and I am honored. I also am quietly strengthened in your midst. There is a network of caring underneath human activity that perhaps is the strongest link we have with each other, with life, and with God. There is smiling silent assurance here. I am so grateful to feel it truly at last. That you are thinking of us at this time is indicitave of your obviously lovely nature. Breathe, be in love (it's there), know you're loved. Stay in your cave as long as you need to. We wish you well and we'll be here when you get back! There comes a time (and not just at the moment of physical death) when we are faced with our own mortality. We realize how fragile we can be, how vulnerable, how we had maybe taken some things for granted. We reaccess our lives and priorities. Did we live a live with passion? Do we have regrets? Do we make new goals for ourselves now? Such events are a major turning point in our lives that usually wake us up to something within ourselves, thereby some people see them as great opportunities. One such opportunity you gave yourself with your openness and vulnerability was to receive more love and concern from many people, including those of us here. I'm so glad to read that you feel it :-) These are miracles. My prayers are with you now. I learned through my ordeal to stay positive and keep living your life the way you want to. Let people know if their being to negative and that if they continue you might have to shut them out just so you can maintain good vibes. Stay away from fear, yours and others for it does no good to live in that frame of mind. The energy I received from our friends here at NCN kept me going and it was powerful, I could feel the strength grow within me. Love yourself during this process, whatever may come your way keep positive at all times.It will be hard not to sink into depression at times but don't stay there,keep moving and living. Lots of love to you my friend. My second prostate biopsy was accomplished Thursday. Two samples were taken from an area of the gland which previously had produced results too close to call, they said. I was more nervous this time, partly because I knew what to expect, but actually it turned out to be easier. I imagine it's a disorienting process no matter how many times one goes through it. Anyway they have to send the samples somewhere and we have to wait another 2 weeks. That will bring the next visit to March 10th, which is my birthday. I know other people who have gone in for urgent news like this on their birthdays. I can't help but wonder if God is trying to get my attention about something. "It's the opposite of what everyone thinks. They assume that when they hang on to the things that matter in this world, they are something. But ask yourself: how could anyone who might not wake up the next morning be important? If, on the other hand, because of your fusion with the Creator you think of yourself as nothing, then you are very great indeed---like the branch of a tree that realizes it's one with the root. And the root is the One without end---the Eyn Sof, the One of Nothing. And so the branch is too---it is a No Thing." Thanks especially to those of you who have replied with descriptions of treatments you know about. Dana will be going along on the next visit and she is busy on the Internet researching all the possibilities and options. Whether results are positive or not, we need to embark upon an investigation of whatever is concerning these doctors. If you know any sites or have suggestions, send them along. Good idea to have full knowledge before going to the doctors. Glad Dana will be with you. From my experience it is much easier with a loved one by your side. That way you have two brains to think and ask questions of the doctor. Hope all goes well for you Jazzy and I deeply empathize with the waiting time. Marie has wonderful suggestions and I prescribe you follow them completely. No excuses now! X O- chin up, feel the love all around you. That is what is important in life no matter the circumstances. These are profound questions Nora, and I feel a change inside just in asking them to myself. I've never been much into "seeing myself" in 5 minutes much less 5 years. I think I'll contemplate with them for a week or 2, and maybe come up with enough thoughts for a new entry in this Log---if such sharing would be of any value to others. "if such sharing would be of any value to others".- really richard...little down on your self are you? Of course sharing with us is of great value. And nora has made some excellent suggestions...be careful though...deep thinking stirs up those inner demons...or angels. We loaded up the car with Dana, Jeroch, and Ilona---Dana taking off from work early---and headed up my birthday highway for the 25 miles to Logan, Ohio, where my doctor maintains one of his offices. It's been 2 weeks since my second prostate biopsy, and the appointment had been set. We were greeted by a nurse as I signed in, who stated in extreme apology that the tests had been sent on to a second lab for yet another opinion. They weren't back and the staff had hesitated to cancel my appointment in the event the fax came in this afternoon. She said it might be another week before we get the findings. My irritation was intense, but slowly I'm settling down (after a dinner of kung pao shrimp), shifting gears, and getting into the continued waiting. This time they're going to telephone when they have the facts, and then I'll work out where and when to talk with my doctor. Dana says the positive side is that there is no definite conclusion that a cancer needs to be addressed. Everyone wants to be certain as to whether it's yes or no. I suppose. relax and rejoice in the love of your family. 31 Aug 2008 @ 12:48: Election '08: You Make Me Feel So Young! 26 Dec 2006 @ 11:29: How's Your Computer? 29 Oct 2006 @ 12:00: Tortured Over The Election?